This thanksgiving was at the same time busy and not busy. It was wonderful. I had thought of taking a little trip to Albany to visit the family seat, but I heard that 1. it takes 8 hours to drive and 2. Michelle wasnâ€™t sure if sheâ€™d have Friday off from work and 3. I had a big chemistry test on the Monday following, and I donâ€™t want to get a C in chemistry. C does not stand for Chemistry, as far as Iâ€™m concerned. Iâ€™m pretty sure B does, but would be pleasantly and shockingly surprised if I found out later that A stands for chemistry. Not likely! So, I decided that in light of my terrible schedule Iâ€™d just stay home. And in light of my terrible ankle injury, itâ€™s a darn good thing I did. I can drive the stick shift around a little bit but lordy I donâ€™t need to do that for 8 hours straight. So we made plans to go to Auroraâ€™s house for a big sumptuous thanksgiving meal, prepared by herself and her culinary school fiancÃ©. And Gabulo came out for thanksgiving as well. And also, I was asked to care for two cats and two turtles. By two turtles I mean feed one turtle and â€œcheck in on Claire while youâ€™re at our house doing your laundry, ok?â€? So I was waltzing around with 4 other-persons keys on my key ring. As waltzing as you can get while youâ€™re on crutches! Wednesday night Michelle and I went to Mariss and Kellyâ€™s to do laundry. That was great. We ordered in ridiculous sandwiches (why do warm sandwiches in Pittsburgh have lettuce on them? Thatâ€™s so strange) and sat around until very late. And then I locked up and went home. Thursday morning Gabulo showed up and we went over to Jaredâ€™s to feed his cats. Now, as I may have mentioned before, Iâ€™m on crutches. That means Clumsy. So I dropped my keys on the way out of his apartment. Then home, where we mashed up about 3X too many potatoes and whipped up a green bean casserole: one of my favorite foods, but also one I cannot justify making for myself and myself only. And itâ€™s a pretty special food that I canâ€™t justify making. The dinner was wonderful and the spread amazing and the company super duper. We played parlor games afterwards and went home a tiny bit too late in a gentle snow. And then I realized that 2 of the 4 other peoples keys were missing. Yikes! So I tore through my bag, and through all of my pockets, and got the flashlight and crutched down the driveway to see if when I had moved my car the keys had fallen. And I checked my car and Gabuloâ€™s car and no key. It was terrible. Luckily I was totally exhausted so I was able to get to sleep ok, but when I woke up on Friday morning too early I could not get back to sleep at all. I kept going over in my head where they keys could have fallen off of my key ring. This was especially frustrating because I donâ€™t usually lose keys. Iâ€™m a very good person to give things like keys and pieces of identification and other things to. And worse, one of the keysâ€™ missing was to Mariss and Kellyâ€™s house, and theyâ€™re so nice about letting us use their washer and dryer that I didnâ€™t want to have to tell them that their key was missing. I figured the keyâ€™s were in two of three places: either in Jaredâ€™s house near the table Iâ€™d tossed them on when we first got there, out side of his apartment where I dropped the keys, or gone for freakinâ€™ ever. We got up and went out to lunch at our wonderful and super and delightful new cafÃ© and then headed over to Jaredâ€™s where first Michelle tried to â€˜break inâ€™ to his apartment through a window (all locked) and then I started buzzing people. The first guy I buzzed came out all disheveled and sleepy and I said â€œyou donâ€™t know me but Iâ€™m supposed to feed come cats upstairs and I donâ€™t have the key, can I come in?â€? and he kind of grunted and stepped back. Yay! I we went up up up and . . . There were the keys! Right on the floor where Iâ€™d dropped the whole right. I was so happy, and we all stayed and petted Jaredâ€™s cats for an hour or so before heading over to feed the turtle. That night we went back to our new cafÃ© for some live music. It is a fantastic place there. Itâ€™s just a few blocks away from our house and is right on the edge of several incredibly different neighborhoods. The proprietress is a cool lady and fun to chat with, and the coffee is the best Iâ€™ve ever had, and definitely the best Iâ€™ve had since Puerto Rico. Is it strange that I only like really strong coffee? I hope weâ€™ll have a chance to go back there often, and really, I think itâ€™s so great to have a local place with live music and a good atmosphere. After 4 years in Spanish Harlem itâ€™s especially appreciated. Saturday we spent all day doing laundry. It was amazing. And then we went to an Ouve show, starring Friend Bruce. Theyâ€™re fantastic, they always are. Sunday morning we had brunch at the coop (another wonderful local place) and saw Gabulo off. Michelle and I went back to CafÃ© Bliss and spent a few hours doing work there, and then I regrouped for Chemistry Fun with my classmates. After, you know, I locked Jared out of his apartment and he had to break in for real. Yikes! Iâ€™ll never be asked to watch the cats again! When I was little we had to go around the table and say what we were thankful for this year. Thereâ€™s so many things Iâ€™m thankful for, but this weekend I was most thankful Iâ€™d found the lost keys and that I had good friends with me to look for them. Iâ€™m totally injured over here. 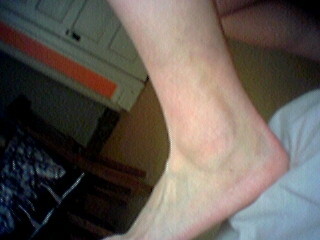 I have a bad knee and a sprained ankle! Itâ€™s positively tragic. My knee went out, and I fell. Someone screamed! I couldnâ€™t stand up. 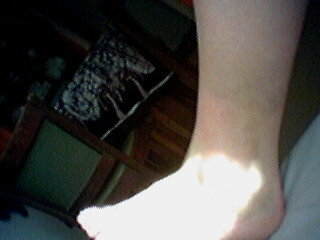 My whole left leg was beat up, and I was in so much pain. Michelle helped me to a stool and I put my foot up on a bar table and sat there for a while, cup of ice on my knee and an ice pack that the best bar back ever brought me. I opened the towel around my wonderful ice pack (a towel! I donâ€™t even use one of those at home on my ice packs. This bar back was FANTASTIC.) to readjust it a little and there was an Icy Icy HAND! It was a rubber glove filled with ice. It ruled. These drunk guys stopped by to check on me. As the first one asked after my health the second ran his hand up my leg solicitously. My very very hair leg. He was totally unflustered, but did walk away quickly. Hee. I made friends with a guy having a bachelor party. He walked out after I did (well, I didnâ€™t walk. I was the hopping queen.) and got to witness the people standing on the second floor deck yelling filthy ugly things at us. Jerks. So, we, being classy ladies, yelled back. They yelled some more, and someone who will remain nameless winged the rubber glove of icy hand at them. They winged something at us, and I pulled out my cell phone and pretended to call the cops. And then we hopped to the corner where our ride had graciously pulled around to pick us up (having to bravely maneuver around the drunk-bus on the corner). And then, we needed crutches for me! I hopped all over the place on Sunday, asking people for rides and jumping around like a fool. I had to go to school to do work, and then to a study group at a classmates house, and while I was away Michelle reconnoitered the scary basement and found a pair of crutchers to use. It was so relieving. The next day my trip to school was excruciating. I had to get in early to finish more homework, so I caught a 6 AM bus. It was awful. It took me 15 minutes to crutch the three blocks to the corner, and I am sure I donâ€™t have to tell you it was nearly dark out then. I ran into my chemistry professor at the bus stop but neither of us noticed the other, really. I got off at the stop before the short cut I took, which wasnâ€™t really a short cut. It took me 40 minutes to crutch across campus on the Iâ€™m-not-really-sure-it-was-a-short-cut short cut. And then I climbed 3 flights of stairs, because thatâ€™s where the trail took me and I sure as heck wasnâ€™t about to go around to the flat side of the building. An hour later, I was in my office. The trip involved some angry muttering, some frustrated tears, and two monster blisters on the palms of my hands. After that, I looked for rides where ever I could. Tuesday I got a ride from Paulina who has a 10:30 class. Wednesday there wasnâ€™t any school, and that was just fine with me. I drove in to take care of some errands. And then it was thanksgiving weekend and visiting Gabulo could drive around (and show off her new hybrid civic in the process! V. nice). And for those of you who really want to know what the doctor said: Monday they thought about sending me for x-rays. I reminded them that I had opted foolishly for plan 3 health coverage, which includes a very attractive and as yet virgin incredibly high deductible. They told me to come back on Wednesday. So I did, parking illegally in a fraternity parking lot across the street and crutching my way over. They said perhaps I had structural damage in my knee (yuck) but that my ankle was doing fine and here are some exercises to try out. They also said acupuncture was not a bad way to go, but it wouldnâ€™t help with my structural injuries which I should totally get checked out when I had a real form of health insurance (goo). 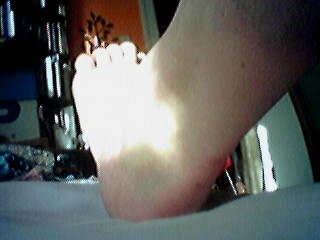 Want to see some totally pixelicious and nearly indiscernible pictures of my ankle? These are from 12/2/03, which I can do because this is an entry that I wrote after the fact and put up even later than after I took pictures. So the swelling is MUCH better than it was, and the bruising is MUCH better than it was too. Itâ€™s kind of hard to see, isnâ€™t it. These are the two big bruise areas. 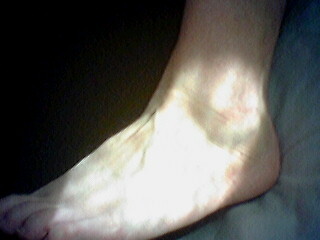 This is where my ankle bone used to live. Itâ€™s swollen! Big fat ugly bone. Big fat ugly swelling. Hereâ€™s more bruise. You know, if youâ€™re into that kind of thing. So thatâ€™s the tragic tragic story of my falling down. Usually I just tumble, and donâ€™t hurt myself badly. Remember the â€œare you an athlete” story? Thatâ€™s usually how it goes for me. But not this time. Itâ€™ll take a little bit longer to clean up from this one.